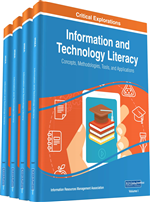 This article provides a conceptual framework underpinning the implementation of an iPad-based curriculum designed to foster critical digital literacy skills. This is followed by a description of the implementation of this process within a full-year 11th grade English course, and reports data gathered from a survey designed to capture student perceptions of the use of iPad-based texts and applications for course content and creation. Through the last decade, the vast majority of students have improved their capacities for communication over the web, while the web has grown increasingly more interactive to accommodate new communication means (Hay, 2010). As a result, students are becoming more adept at skimming information for the answers they seek, but are losing the ability to maintain sustained attention to a single source in the manner teachers often desire (Burbules, 1997; Hay, 2010). However, as Livingstone (2004, p. 79) explains, “audiences and users of new media are increasingly active – selective self-directed, producers as well as receivers of texts.” It is the task of educators to design learning activities that help students to move from flighty, casual browsers of the Internet to those who become critical consumers and content creators in order that they may best take advantage of existing and emerging web-based technologies. While individuals encounter hypertext links daily in their use of the Internet, in the classroom setting it is important to expand this term beyond the simple use of clickable links to include a notion of entire hypertext “books.” Whereas in a traditional print narrative one turns the page to find out what happens next, in hypertext “what happens next, what else the text will yield by way of narrative, of information or of meaning possibilities, is at least partly a matter of what link the reader chooses” (Carusi, 2006, p. 168). This unique capability of hypertext changes the way in which texts are read in web-based readings, potentially altering traditional patterns of student interaction with “textbooks” within classroom settings. In hypertext environments, text is often non-linear or multi-linear, connected through links rather than the linear nature of page turning, which allows readers to choose their own path through the reading (Mobrand & Spyridakis, 2007; Uso-Juan & Ruiz-Madrid, 2009). The usage of links can expand the way text is read, with hypertext links creating implied connections and juxtapositions for the reader (Burbules, 1997), often not present in traditional print text. For students who are increasingly both familiar and adept at interaction in an environment connected through hypertext links, the increased freedom and opportunity this presents can be used to open the door to a more engaging educational experience.